We’d love your help. Let us know what’s wrong with this preview of Exes on the Beach by Hope Izzati. Gorgeous, half-English, half-Indonesian girl, Nancy Niven, is making the big bucks in the New York property market. But one particularly tough deal, while in the middle of a messy split from a boyfriend, leaves her emotionally exhausted, so her boss sends her away for some secluded rest and relaxation on the firm's private Caribbean island. As the helicopter leaves her on Gorgeous, half-English, half-Indonesian girl, Nancy Niven, is making the big bucks in the New York property market. But one particularly tough deal, while in the middle of a messy split from a boyfriend, leaves her emotionally exhausted, so her boss sends her away for some secluded rest and relaxation on the firm's private Caribbean island. 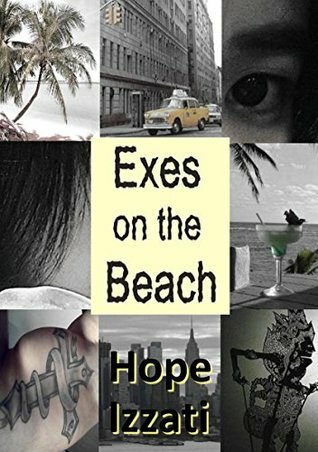 As the helicopter leaves her on the beach and lifts off, she is stunned to find that she is not to be alone, after all, but will be sharing the paradise with six of her Exes: all very attractive, but with personalities ranging from adorable to downright scary. To ask other readers questions about Exes on the Beach, please sign up. sorry, I know this is out of your book, but are you related with Fathia Izzati?